Snowdrops, daffodils and singing song thrushes, it must be true! Time to think about the season ahead. We’re recruiting for 2 more summer posts, one paid and one voluntary, see below for details. One day at the end of January, we woke up to proper snow, unusual for here. It doesn’t hang around for long though, here’s the same view later in the day. There was even snow on the beach! Can you spot who’s been out and about here? 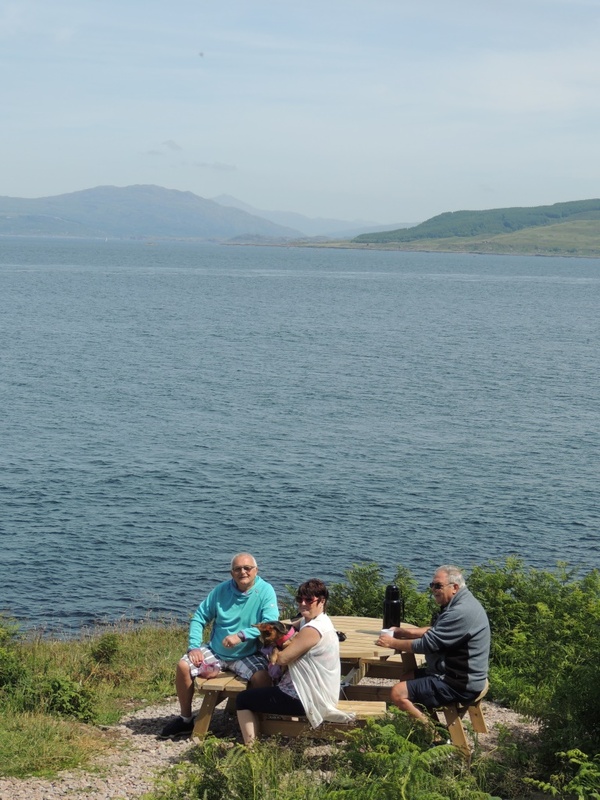 A few days later it had mostly disappeared, and we had a perfect sunny day for a little gathering to say thank you to a few of the lovely volunteers who’ve helped us out over the last year. 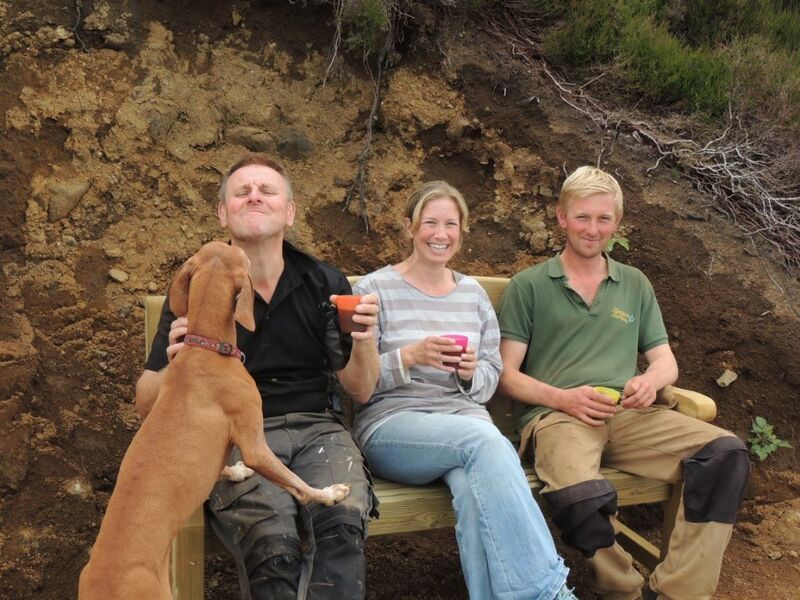 If you think you might like to join them, we are recruiting for a full-time Volunteer Assistant Ranger for 3 months this summer. This is a great opportunity to develop skills and experience in nature conservation and rangering. 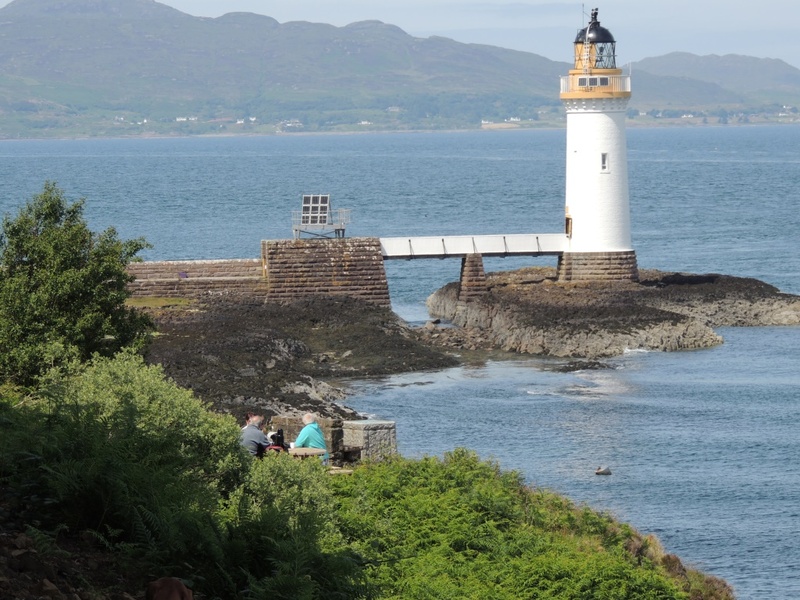 The role is based in Bunessan and involves assisting with varied tasks over a number of island sites including Iona and Staffa. Tasks will include wildlife survey work, delivery of education projects and public events programme, providing information to visitors, practical maintenance. Accommodation and some travel costs will be covered. You must show enthusiasm for wildlife and the great outdoors. Some knowledge/ experience in the relevant field would be useful but more important is flexibility, good communication skills, an ability to work under your own initiative, and a desire to learn. You will need to be willing and able to work inside or outside in all weathers, including some lone working in rugged coastal terrain. Some weekend/evening hours will be required. 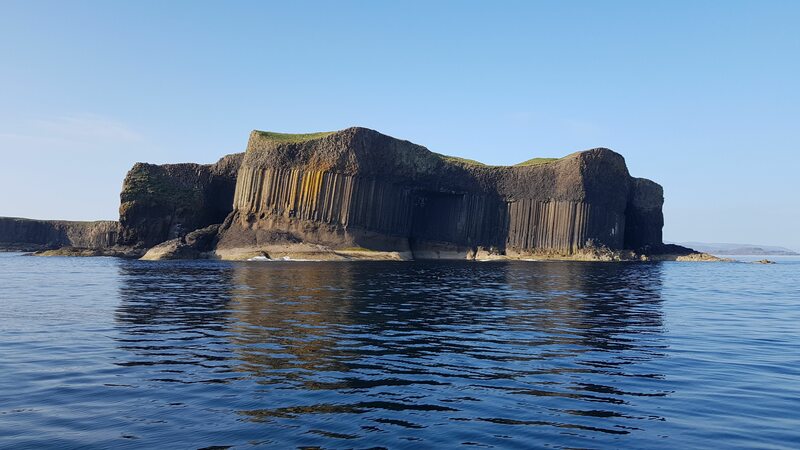 We are also recruiting for a (paid) Visitor Services Assistant for the island of Staffa, again feel free to contact me if you’d like more details. Application form and job description can now be downloaded directly from the NTS Vacancies page here: https://www.nts.org.uk/charity/Vacancies/ Closing date is 22nd March. Finally, check out our Facebook page to see some of the creatures being sent to us for Tiroran Woollen Woods! There’s still plenty of time to join in as deadline for receiving your creations is the end of April. Specialist path workers have stabilised the slope below the ladder at Burg, reducing erosion and improving access to the beach. Unfortunately the day after they left heavy rain caused a spectacular landslide further back along the coast which completely buried the path (at grid reference NM 411 263), so if you’re planning to go the fossil tree any time soon you will need to be prepared to scramble around the bouldery beach below it, and judge for yourself the risk of falling rocks from above. Upper figure shows where the path used to cross the slope! Depending on weather conditions it may be better to turn back at this point, but it’s still a lovely walk giving a taste of our dramatic coastal scenery and wildlife. On my visit this week we were bathed in lovely winter light and enjoyed watching an otter fishing just offshore. I’ve been helping out with beach school sessions with the younger children from Iona primary school and nursery. 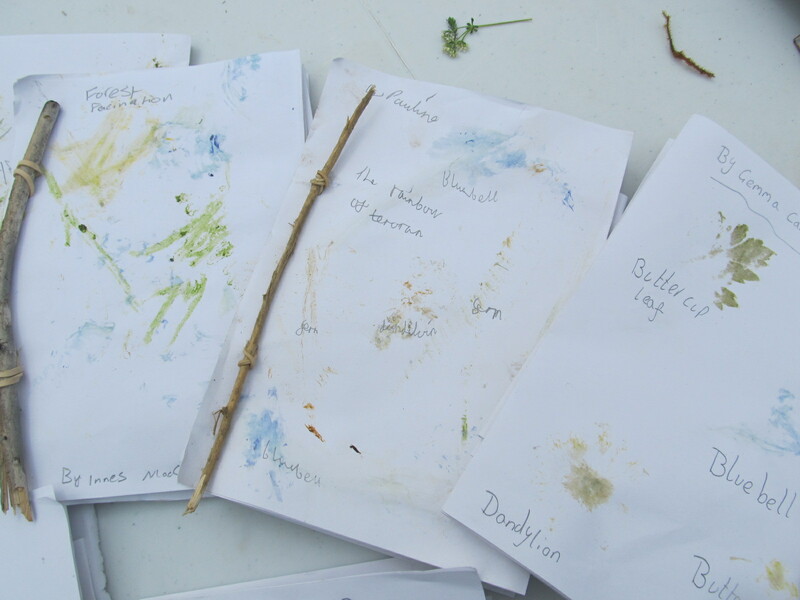 Investigating rockpool life, trying out seaweed recipes and playing wildlife-related games on the sand doesn’t have to be a summer-only activity! How many tracks can you spot in the sand? 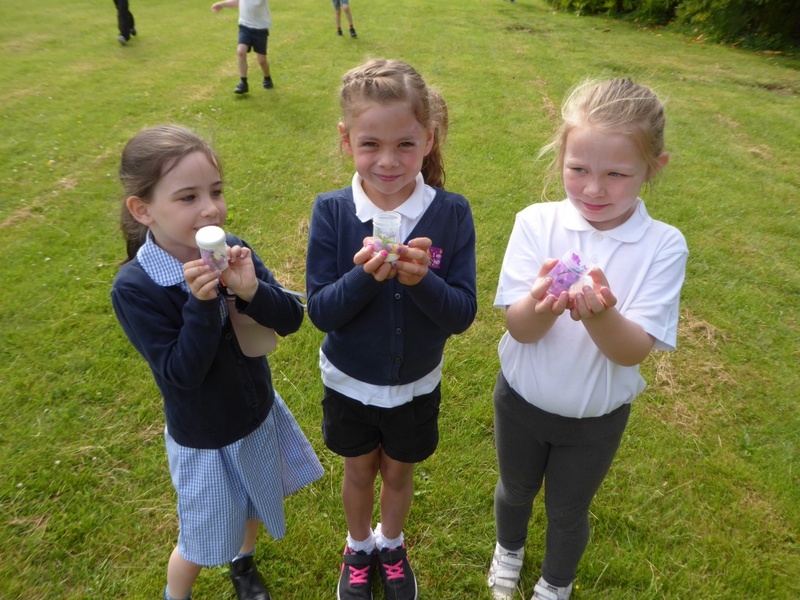 At Bunessan primary, afterschool nature clubs have been investigating seed dispersal and making hedgehog hibernation homes for our gardens. 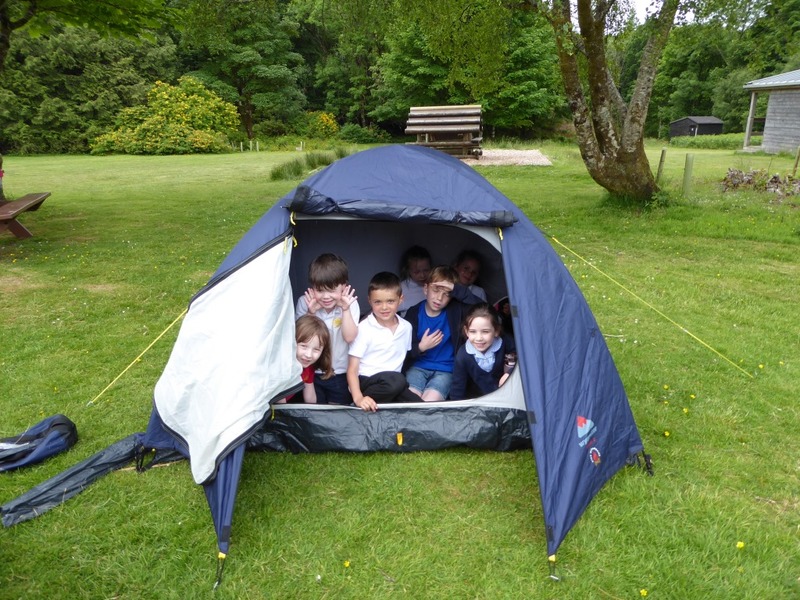 Argyll and Bute council also featured our Lost Words project as a good example of raising educational attainment. Back at the end of August, a group of Thistle Camp working holiday volunteers on Iona not only did a great job painting bridges and noticeboards, digging ditches, making stepping stones, pulling bracken and beachcleaning, but also inadvertently caused a bomb scare with this mystery object, which turned out to be the propellant canister used to launch a missile from a WWII US Navy ship! Never a dull moment! I’m very grateful for everyone who gives their time and skills to volunteer throughout the year, in particular some of our younger volunteers during this Year of Young People. Finally, here’s a sneak peek at a new project for next year. We are going to be hosting Woollen Woods at Tiroran Community Forest. We’ll be asking everyone to get involved by creating woolly woodland creatures (animals, plants or fungi and knitted, felted, crocheted, pom-poms, any technique you like!) to go on display at the forest next year. 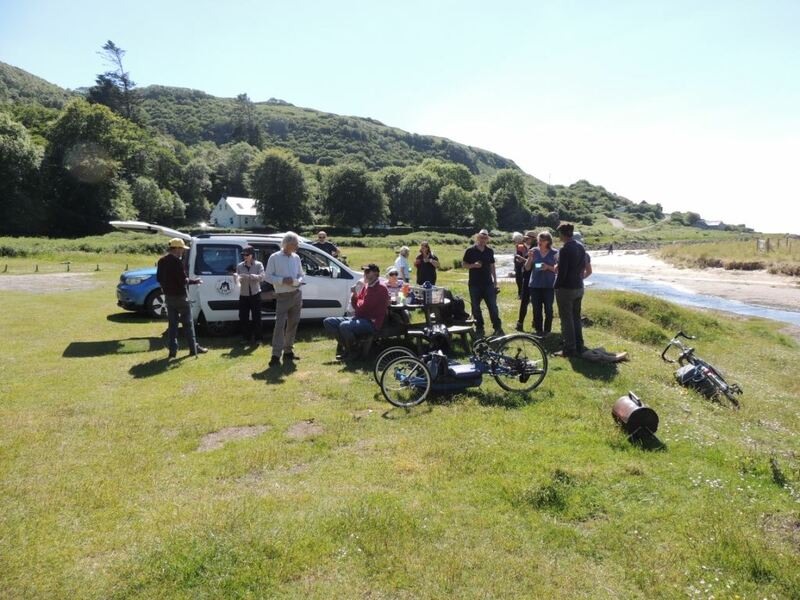 Look out for more information coming soon, or if you can’t wait to get started, you can post any contributions to: Mull and Iona Ranger Service, c/o Tigh na Rois, Millbrae Cottage, Bunessan, Isle of Mull, PA67 6DA. We won’t be able to return any of your creatures but we can promise them a starring role in our outdoor exhibition next summer! Some mice have already got in on the act! 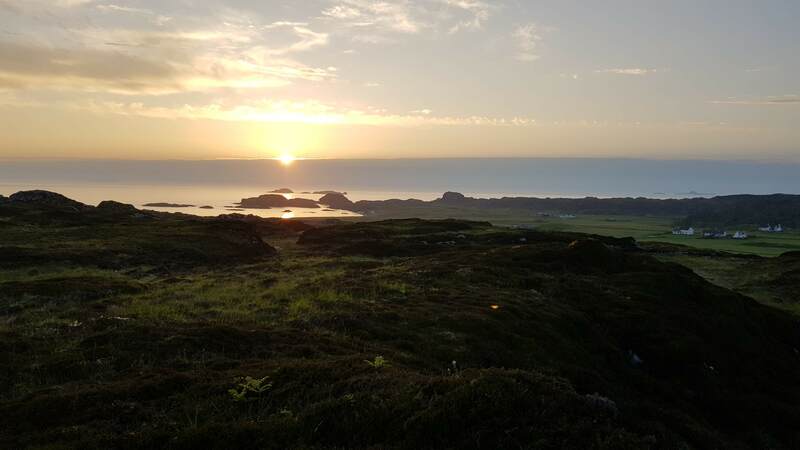 Another update from us here on the Ross, but also a fond farewell from me as my time on the island volunteering with the Ranger Service draws to a close – what a summer it’s been! Some fantastic wildlife encounters and successful events along with unbelievable weather for the first few weeks of my stay have definitely made this a summer to remember. 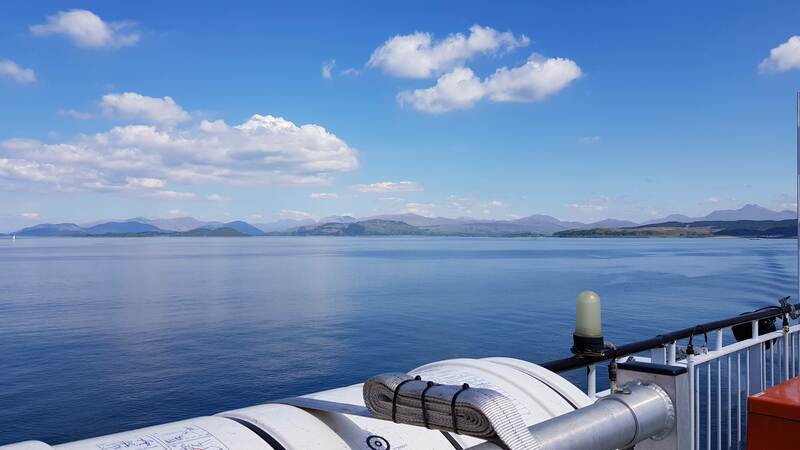 It’s been great to experience such a wide range of wildlife survey techniques in some amazing locations – from monitoring Storm Petrel chicks on Staffa to surveying plants under the dramatic cliffs of Burg, it’s sometimes easy to forget that this is an actual day job! A couple of times this summer Emily and I have been helping Lynne Farrell, the county recorder for the Botanical Society of the British Isles, update her plant records – most recently on Burg coinciding with our own plant survey, and earlier in the season we were lucky enough to go out to Little Colonsay on Mark Jardine’s boat. Here we saw (and learnt) loads of interesting wildflower species, including the vibrant Bloody Cranesbill. 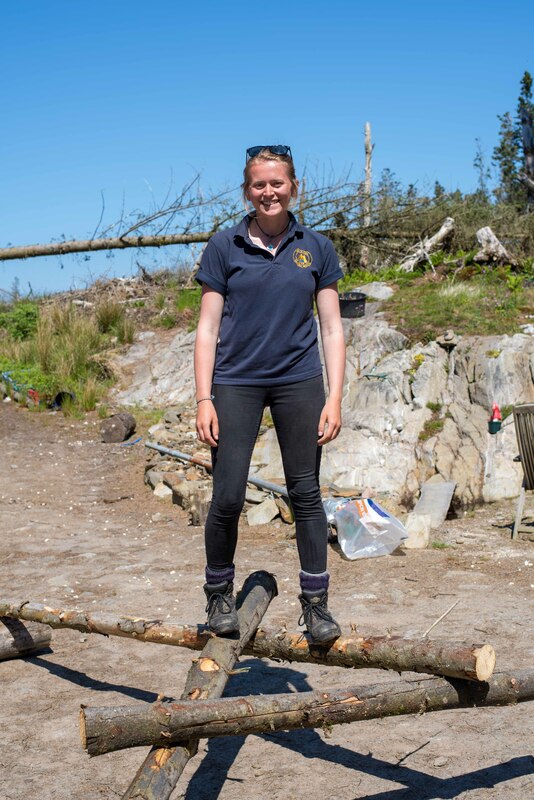 We’ve also had a couple of successful events recently – Abbie, who was doing summer work experience with us, held a survival skills event at Tiroran forest which included building a rather impressive den and then foraging for plants to make tea out of at the end. A great day had by all, even if the fire took a few valiant attempts to get going! The next week I was back at Tiroran leading an Eagle Hide walk, where we had nice views of a white-tailed eagle soaring over the treetops in the distance. I also organised and lead my own event recently – a drizzly yet interesting morning on Uisken beach exploring the rockpools and the beach, finding lots of cool species including breadcrumb sponge and by-the-wind sailors. In mid-July I went to work with the NTS ranger team at Ben Lawers NNR for a couple of weeks, a very different landscape to what I’m used to on Mull. Here I got to experience some of the more land management perspectives of rangering including bracken bashing, tree planting with an NTS Trailblazer camp and path maintenance. The weekend that I arrived coincided with the launch of Chris Packham’s Bioblitz campaign – the team at Ben Lawers took on the challenge of 24 hours of biological recording, and we were the first site for Chris Packham and his team to visit, resulting in a very long but enjoyable day out recording on the hill. Being at Ben Lawers was great to experience working in a team of rangers, and my thanks go out to team for making me feel so welcome there. 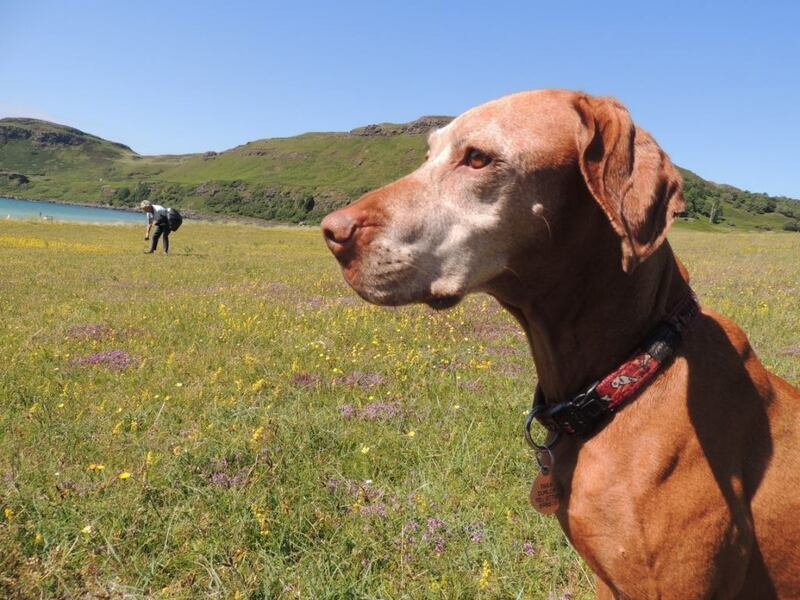 And finally, how can I not talk about some wildlife encounters whilst I’ve been here on Mull? 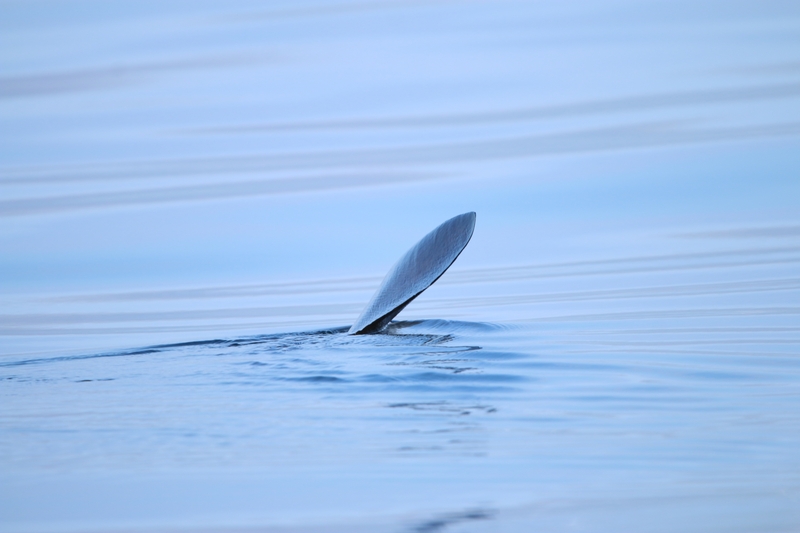 You will have read my previous blog post about the evening trip to Staffa and the multitude of basking sharks, which still is a massive highlight for me, but it’s been a great few months overall for wildlife. Recently Emily and I were out on top of the cliffs at Burg, just walking to our National Plant Monitoring Scheme plots, when a family of golden eagles casually cruised by at eye-level. What a treat! By far the best Goldie sightings I’ve ever had. Along with that, I just can’t tire of seeing white-tailed eagles – looking up to the sky and seeing this unmistakeable ‘flying barn door’ is such a fantastic privilege. Somehow, I managed to go the whole of June and July without seeing an otter, on the coastline that is supposedly so famous for otters, and I was starting to wonder what all the fuss was about. However, when my boyfriend and parents were over visiting a couple of weeks ago, an otter conveniently showed it’s face and allowed us to watch roll about preening in the seaweed. And typically, I continued to see another 2 otters in that same week! Along with the west-coast signature eagles and otters, this summer has been great for hen harrier sightings and lots of interesting moths and butterflies. I’ve also learnt loads of wildflowers – Emily has put up with my consistent pointing and saying “ooh what’s that?” for the last few months, so for that I’m very grateful for her patience! View from the back of Fingal’s Cave during site tour with repair contractor – cave access is still out of bounds but walkway repairs are well underway! Overall, volunteering with the ranger service has been such a valuable experience, and I’m so thankful for being given this opportunity. I’ve learned a countless number of new skills, met some great people and seen some fantastic wildlife. 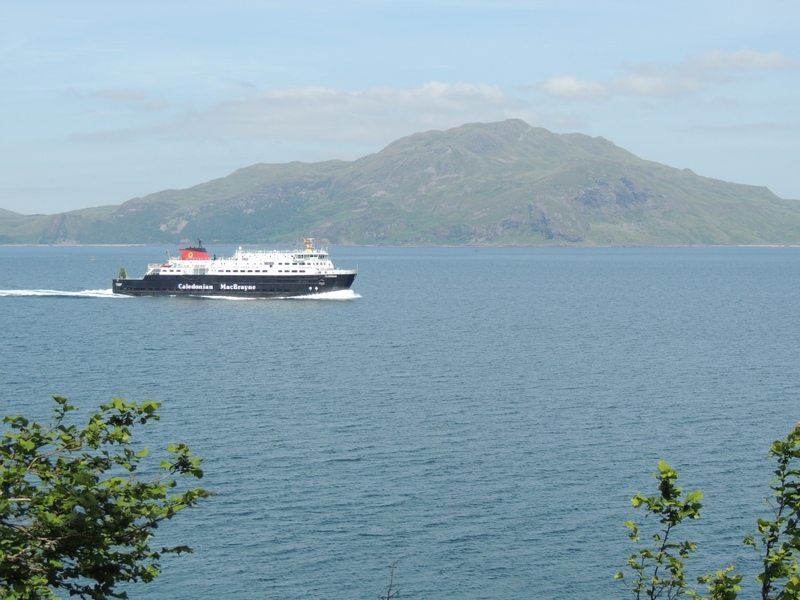 I’m going to miss this place far too much, so I’m sure Mull will see me again soon! Could be what our wildlife is thinking after a very mixed-up season. Late spring, hot dry weather with the occasional sudden stormy wet day to contend with and now autumn colour seems to be creeping in early. 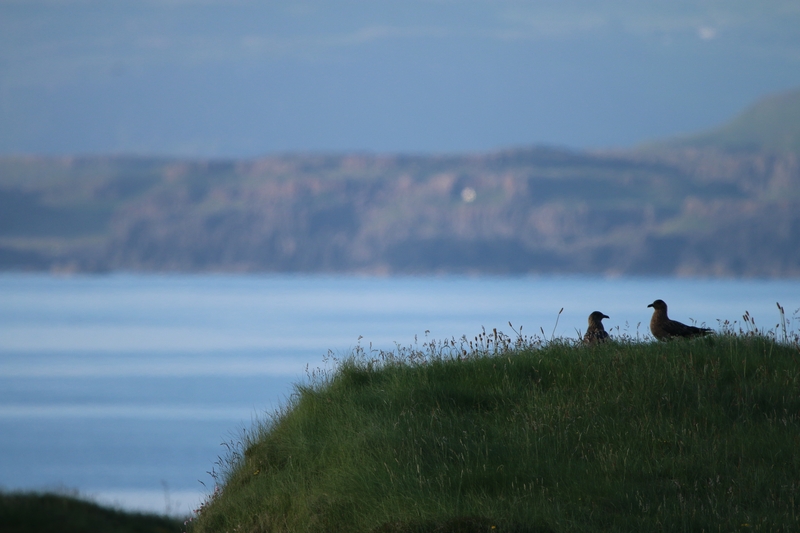 The Ross of Mull rangers are still here too – not much news from us lately I know, so let’s catch up! 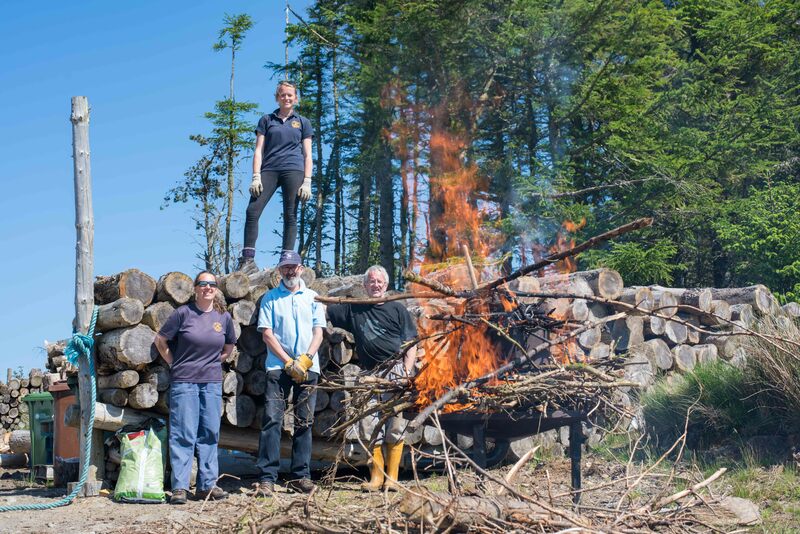 In early June we had a group of enthusiastic volunteers on a working holiday, the National Trust for Scotland’s Thistle Camp scheme, visiting Burg. A great chance for us to get all sorts of maintenance tasks tackled with many willing pairs of hands. We had scheduled the camp earlier than usual hoping to survey our rare Slender Scotch Burnet Moths and much to our relief, numbers were the highest for several years. These small but beautiful insects are only on the wing for a few weeks each June and it seems they have shifted their flight period to earlier in the year. Most of the feral goats however were nowhere to be seen on our walk around the Ardmeanach peninsula, perhaps they had travelled elsewhere in search of water during this unusual dry spell? However it wasn’t a wasted day as we were able to make good use of the walk by splitting into groups and one group set up some new plots for the National Plant Monitoring Scheme which will now be checked twice each summer. The Thistle Campers also tackled repointing work on Burg’s bothy which is undergoing restoration, cleared out ditches and pulled bracken to improve moth habitat and reduce damage to our archaeology. Many thanks everyone! The same week Georgia and I led a walk to the fascinating St Martin’s caves on Iona. A great place to visit as it’s quite hidden away and only accessible at low tide. Sadly the rain poured down but the few hardy souls who joined us had an interesting time learning about crofting, geology and seaweed! Georgia has been working on a productivity survey of one of Iona’s shag colonies. Unfortunately a day of heavy rain amongst weeks of sunshine caught them off guard and lots of nests have been washed away. Shags do stagger their breeding times so we’ll keep an eye on things to see whether they can rebuild and lay more eggs or whether they’ll give up and wait until next year. Shags nesting at Pigeon’s Cave. Photo credit Alan Foulkes. In late June we had another lovely walk along the coast at Carsaig, plenty to see including ringed plover chicks like little balls of fluff on stilts running amongst the rocks, and interesting fossils on the beach at low tide. It was almost too hot though so some of the group enjoyed going behind a waterfall into the coolness of the cave beyond. It’s been great having local girl Abbie Cato on work experience with us during the summer holidays. Living at Knockvologan she was the ideal person to help us out with her knowledge of Erraid on a guided walk around the tidal island. She’s also lent a hand with several other events including our stand at Bunessan Show and our summer nature club on Iona, for which we had 18 children busy with a treasure hunt learning about what nature does for us, and an afternoon of art and games on the beach thinking about what we can do for nature. Both Georgia and Abbie are working on their John Muir Awards and have contributed an article to Young Scot’s My Story 365 as part of the Year of Young People. With the warm weather it’s been a good year for butterfly sightings – some of our highlights have been a rare Marsh Fritillary in the office garden, the lovely Scotch Argus and the Grayling with its camouflage pattern on the underside of the wings – and we have been promoting the Big Butterfly Count at our events including our stand at Uisken Games where we were kept busy with sea creature facepainting and making seed bombs and badges. Our Biodiversity Day in the garden at the Ross of Mull Historical Centre turned up some great moths from our (harmless) trap set overnight, including the stunning Garden Tiger and the less common Old Lady, last recorded on Mull back in 2009! …looking at history in the landscape around Iona with a lovely American family, plant surveys at Burg, more bird surveys and visiting archaeologists on Staffa (where repair work has commenced on the cave walkway) and leading eagle walks at Tiroran forest and it’s been a very full and interesting summer so far. … and our events have been hotting up too! 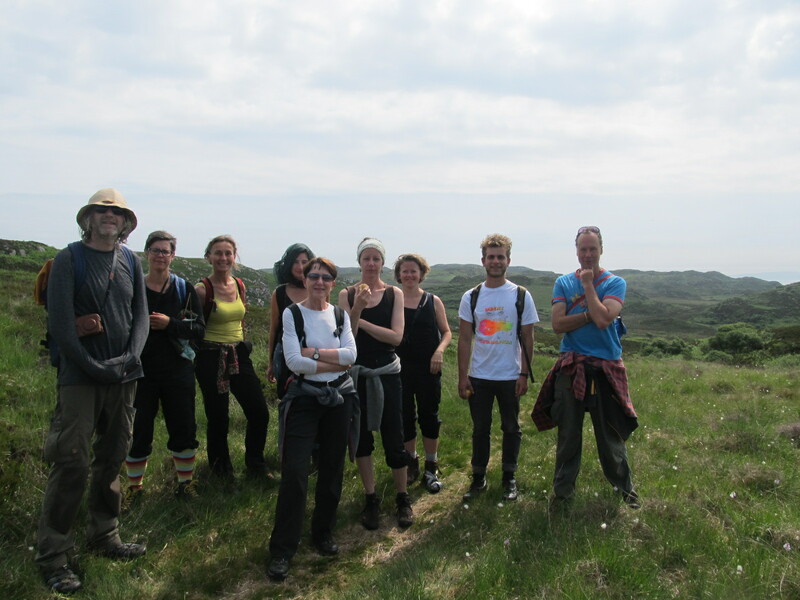 Our event this week ‘Hike up Scallastle’ was tough and the scorching sun didn’t make it any easier. 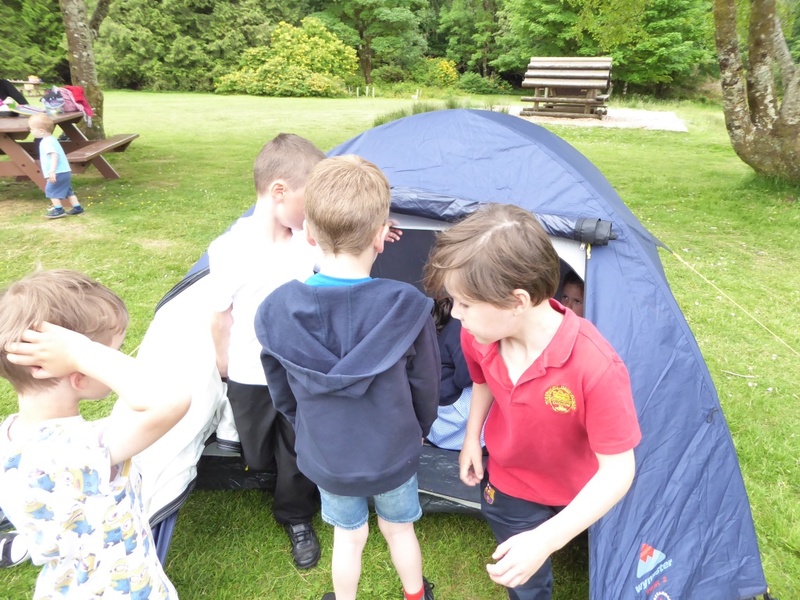 We had a small group of four, starting in the car park we checked our water supplies and insect repellent (boy was it needed!) then set off up the gravel track. 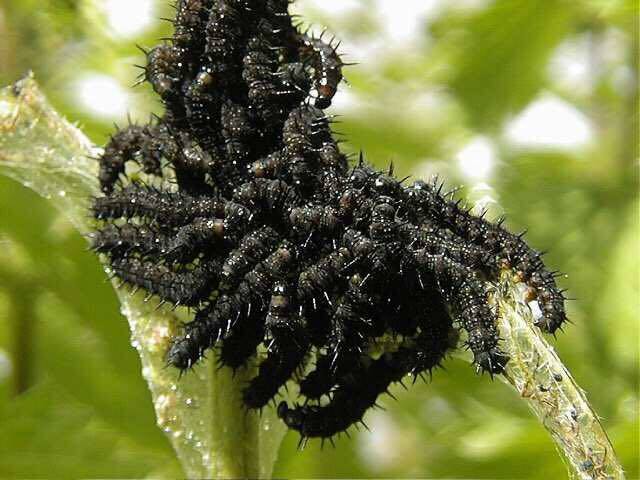 As we made our way up the track there were dozens of cinnibar moth catterpillars munching their way through the ragwort. Our first species of the day and an interesting one at that. We continued be drawn in by the caterpillar covered ragworts until our attention was caught be a real island star, a MALE HEN HARRIER! We watched the harrier dancing above trees until it was out of sight. What a captivating first 10 minutes we’d had. As we proceeded on I was talking (or maybe boasting…) about a garden tiger moth caterpillar I had found at Tiroran forest and then as if by magic Nick found a dead one right on the track! Seeing as so far any animal we had talked about had appeared in some shape or form I tried my luck with giraffe and mammoth, but unfortunately neither beast made an appearance. As the biting insects homed in on us we quickened the pace and had almost got to the bridge but something caught my eye… CARNIVOROUS PLANTS! There were both round-leaved sundew and butterwort on the moist boggish ground by the bridge. Some of them even had unlucky midges caught in their traps. As we started the steep part of the walk, sundews filled the side of the track much to the amazement of Nancy who walks at Scallastle regularly but had never noticed them before. As we got closer to the next bridge I noticed what I thought was a fritillary flying just ahead. So I marched forward to get a closer look and sure thing it was a small pearl-bordered fritillary! We then found a couple more floating above the water and even managed to get the scope on them for a closer look. I then went to look for some smooth newts I had seen up there a week ago but the pool they were in had dried up. Nothing left but a toadlet hiding in the flakey mud. The final incline was ahead of us and it was a real scramble, but the bench at the top plus our packed lunches were calling. With the sun still beating down on us, the rest at the top was needed. While we tucked into our lunches, or an apple in my case, there was a tree pipit perched and calling right in front of us. Suddenly it flew off and we could hear a couple more pipits calling too, although this call was slightly higher and more frequent. SPARROWHAWK! A male and it flew right past us and perched on a tree towards the ridge. I quickly positioned the scope but sods law just as it was in the frame it flew off. As we rested and scanned the mountains a grey wagtail flew over calling in its usual manner. We were almost ready to start heading back down to the carpark when Nancy spotted a bird near the summit. I got the scope on it and it was another island star, a GOLDEN EAGLE! We watched the eagle soaring around for a few minutes before it flew out of sight, this felt a natural time for us to descend back to the carpark. A Dark giant horsefly, they are almost 3cm long and can give one heck of a bite. Hence why I crushed it with my heal… sorry if that offends you. Before I sign off here I just want to thank Nancy, Yvonne, Jenny and Nick for making the walk a real pleasure! 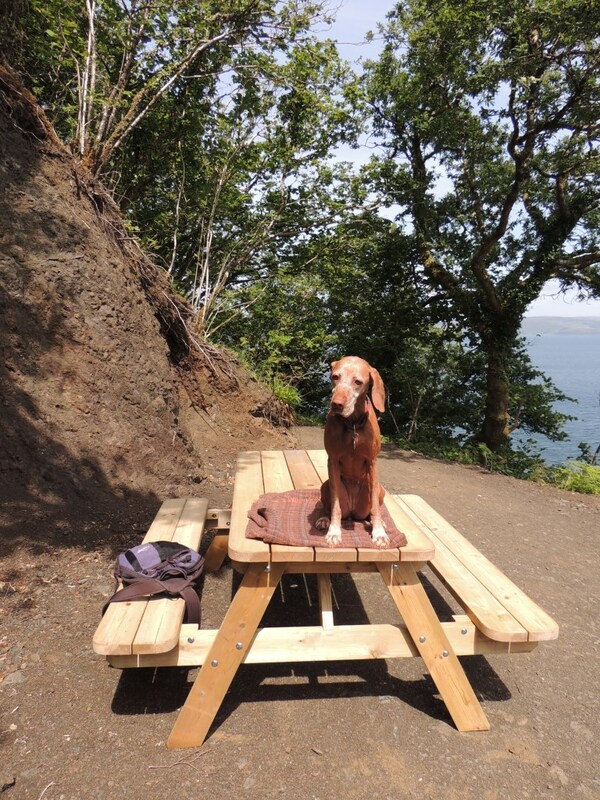 Here up the north end of Mull we have been making the most of this fine weather. 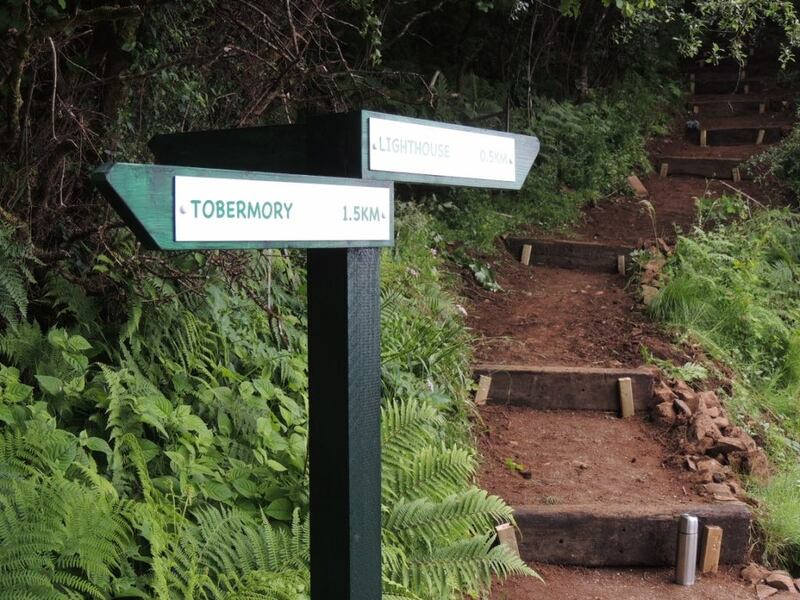 The Lighthouse path, Tobermory is just about completed with the last of the steps signs and benches going in. All the feedback from visitors and locals has been so appreciate it makes all the marching along in 6 inches of mud this time last year seem so far away. Calgary Bay and the machair are also looking good, Last year we had a donation page which allowed us to fence of the machair and thus regulate the grazing of the sheep in partnership with the grazier. Last year there were many more flowers but this year for the first time we have seen the reintroduction of orchids. 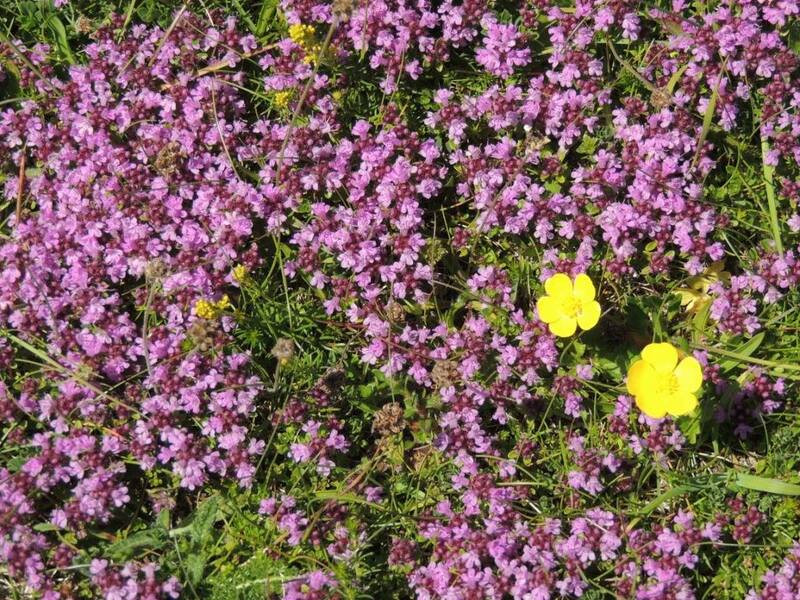 Species seen so far this year are bird’s foot trefoil, buttercup, daisy, oxe-eye daisy, white and red clover, milkwort, lady’s bedstraw, thyme, stonecrop, hawkweed, yarrow and Northern Marsh Orchid. It is planned to do another transect survey in July to see what we have compared to when we did it this time last year. 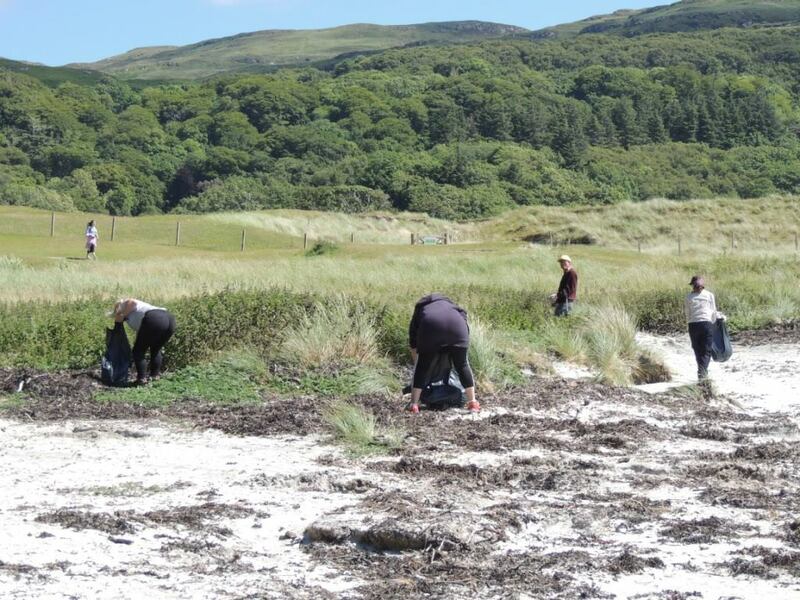 We had a beach clean and catch up a couple of weeks ago and it was lovely to see a mix of locals and visitors all helping to tidy up the beach and pull thistles – a rather prickly job left to those with heavy duty gloves. I had a lovely morning in Aros Park with Tobermory P1 and 2. 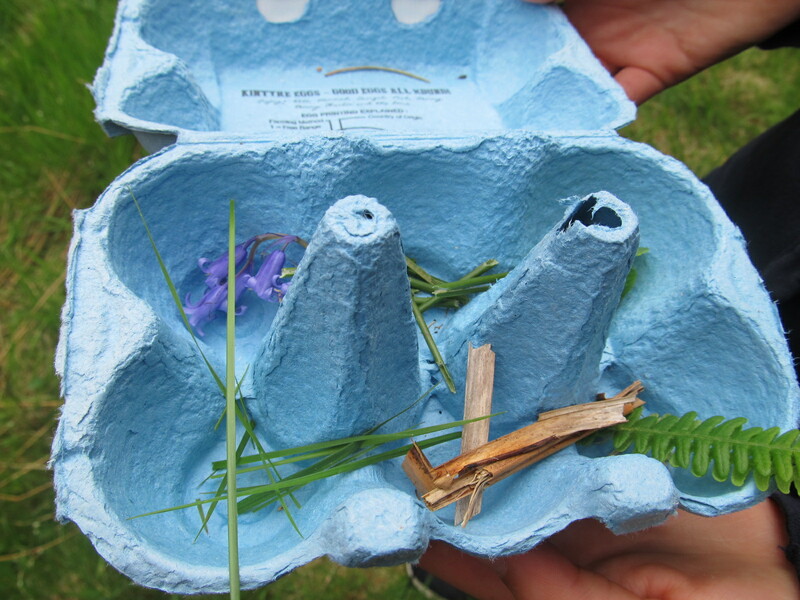 We did lots of environmental based running around games and then built a hedgehog home. The morning was finished off with a sausage sizzle and tent building on the lawn. 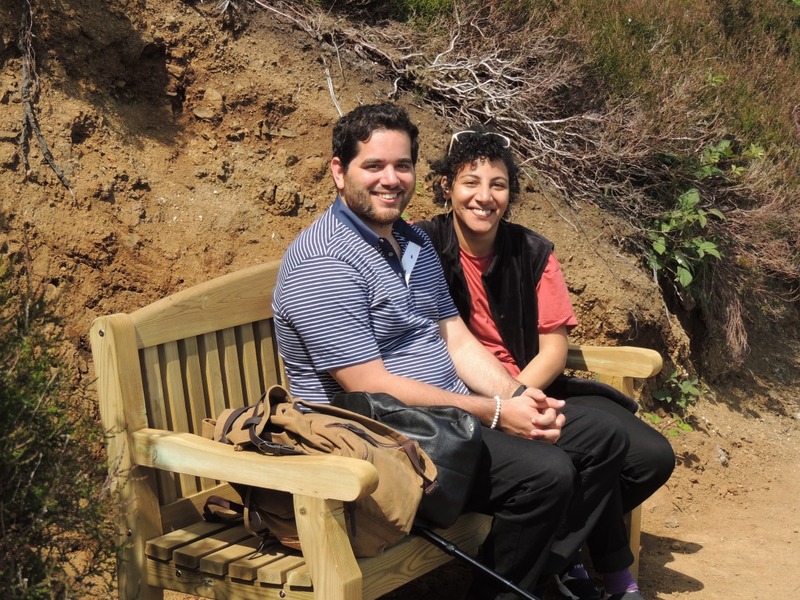 On the 20th of June we had a lovely guided walk around Ardmore and again the weather was kind to us. The flowers along the path edges were beautiful but all wildlife was lying low except the peacock caterpillars. Wildlife is full of suprises! 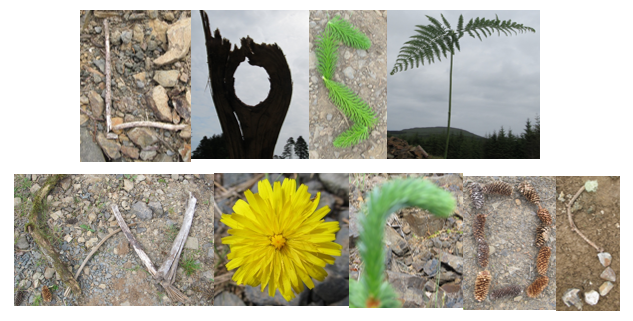 Firstly I would just like to introduce myself as it’s my first ever ranger service blog. I’m Cian the seasonal ranger for this year. 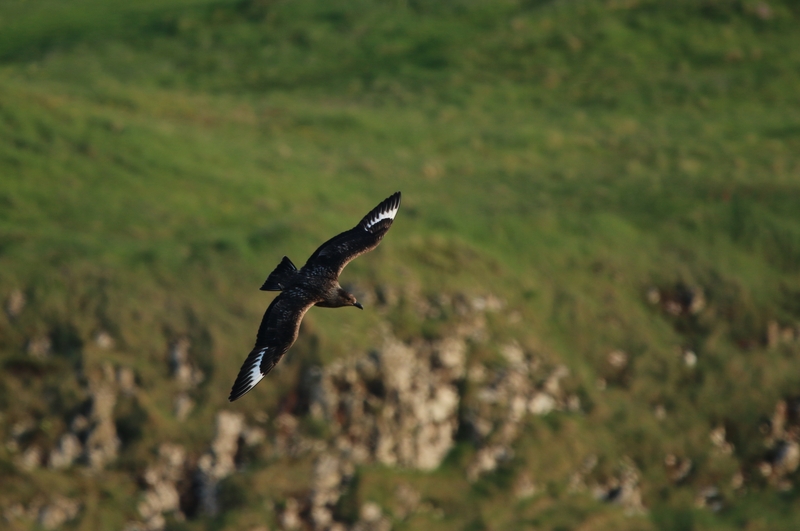 Primarily I have been working on the Mull Eagle Watch project, however I have also been running and planning my own events too. The first solo event I did was actually covering for our friend Kerry over at the Glengorm wildlife project. This was a guided wildlife walk around the estate for a lovely couple from Australia who were staying in the castle. They had expressed how much they wanted to see an Otter so I felt obliged to try my best! As many of you will know Otters can be very elusive and difficult to watch even if there are hundreds on Mull so I did feel a bit of pressure. It was a beautiful day so the stroll down to the shore was filled with sunshine and a variety of birds such as meadow pipits, wheatears and skylarks. Once we were down at the coast we scanned the shoreline for wildlife. The couple were new to most of the species here so the shelducks, shags and oystercatchers were all really exciting to see. Now the hunt for an otter really began, I was scanning and searching every area we could see but no luck. 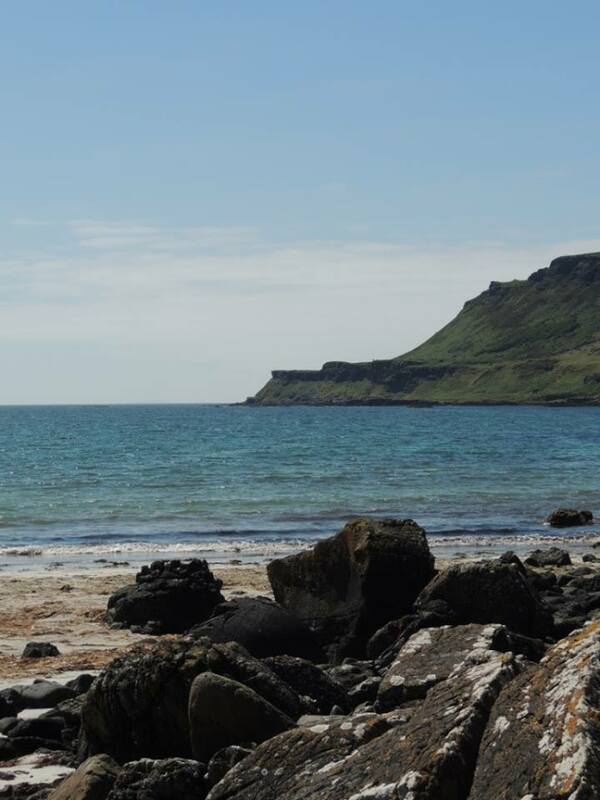 As I cast my gaze slightly further out to sea I noticed a large blondey brown lump on a rock… It was a white-tailed sea eagle! As I scrambled to set the scope up for them to have a look it disappeared. I started ferociously scanning to see where it had gone when something else popped up in my binoculars, an otter! As we watched it swimming around near a small tidal island we realised there were in fact two there. We continued to watch them swimming around and scaring the gulls as they clambered onto the island. They eventually went out of sight after 45 minutes or so. A real success and relief to have found what they really wanted to see. A great day even if I didn’t get a pic of the otters. 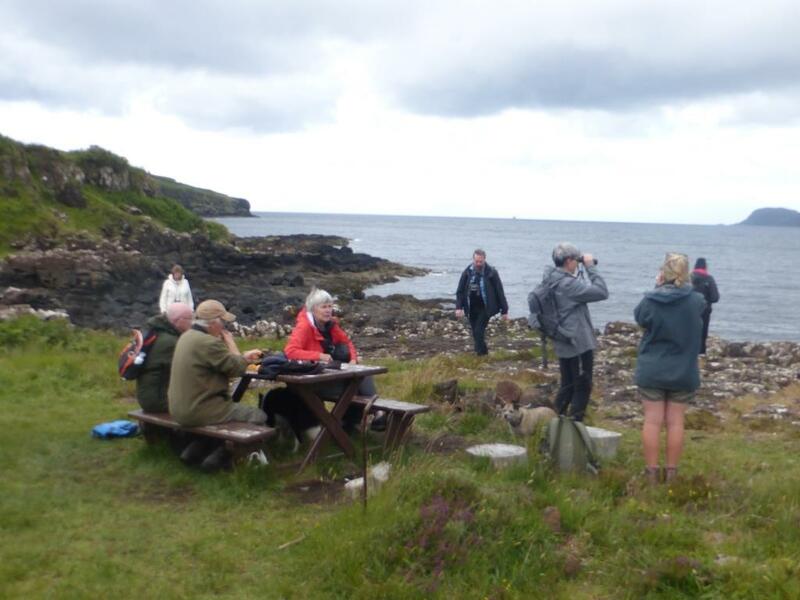 My next event was back up at Glengorm for a very early dawn chorus walk. A couple of early birds ventured up to join me and we definetly caught the metophorical worm. It was a clear and still morning, perfect for tuning in to the songbirds morning choir. On our way to the woods we spotted a group of mountain hare lounging in a field, this was a real treat as I had only ever seen a one or two in my life. Once in the woods the birds did not disappoint, blackcaps and chiffchaffs stole the show. 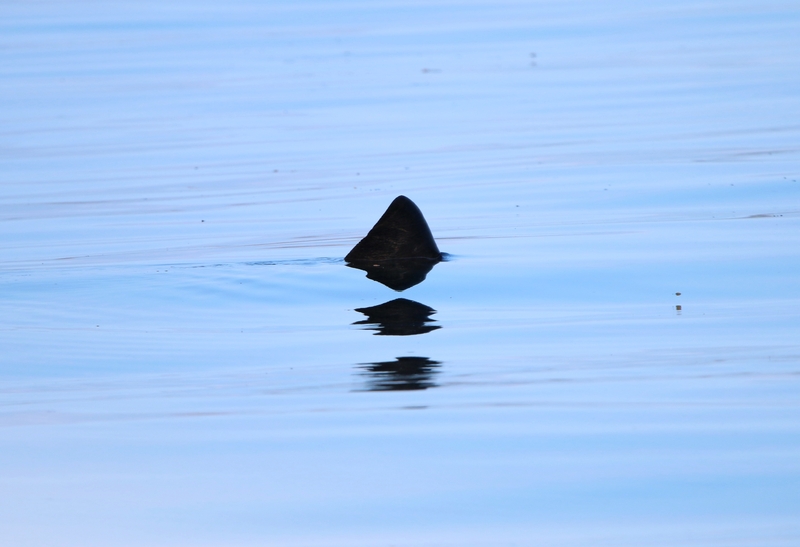 We then meandered to the coast to see what we could find lurking in the sea. On the way there was a whitethroat calling out from the scrub, sounding like a tiny chainsaw. When we got to the shore we were greeted by some sleepy seals just about waking up. We sat and watched them for a while and they slowly got more awake and then inquisitive. They proceeded to get closer to have a look at us. We then left the seals to walk further along the coast, as we did we found a couple of eider ducks to cap off a magical morning. A week later we had a meeting at the office. Before the meeting I had my lunch break at Aros bay, I was watching some red-breasted mergansers when a couple of curlew flew in. I don’t see these birds as much as I have done in other areas so it was quite enjoyable. They suddenly started calling and both took off, as did the gulls and other birds that were on the shore. As I looked up I realised why, a white-tailed sea eagle was flying overhead. Once this had flown out of sight I tucked into my sandwich only to put it down again as all the birds started calling and flying again. I was anticipating another eagle and sure enough there was another big bird in the sky heading towards me. Although this didn’t look like an eagle through my binoculars, it was really white… an OSPREY! What a lunchtime treat! Our meeting was about how the Mull Eagle Watch pair of white-tailed eagles clutch had failed due to an intruding eagle. So we thought we would see how the Tiroran pair were getting on. They had more success so we thought that it would be a great idea to do a ranger service event there. So this week I took a group there with some exciting views. The nest was in full view and we even had one of the pair come and perch in a tree even closer to the hide. Another great wednesday doing my ranger service duties. Stay tuned for the next few events. For those interested I will be running a guided walk at Fishnish on June 6th. I hope to see some of you there and for those who can’t make it i’ll fill you in on my next blog installment. Keep your eyes in the skies, Cian.